Professor Jez Moonbeam, originator of impact-resistant safety crackers, has invented a new type of electricity, which he claims is less dangerous, easier to store and results in less wear and tear on domestic appliances than traditional electrical current. Alternating Current - the shiftier, more wayward cousin of direct current, which finds its way into your house via a more circuitous route using a series of disguises and false passports. And finally, Static Electricity, which we buy in tins and jars and usually requires a bit of a prod and a shake to get it to come out. However, what these three types have in common is that they are all 'spikey and jagged' which is why you are likely to seriously hurt your finger if you try to touch them. Anyone with good eyesight or access to a half-decent microscope will be able to see this for themselves. Simply place a small piece of electricity on a slide, pop it under the lens and you will be able to observe that it's all raggedy and frayed at the edges. It's only to be expected that people who come into contact with it will start to feel a bit poorly and find themselves slightly on fire and occasionally dead. 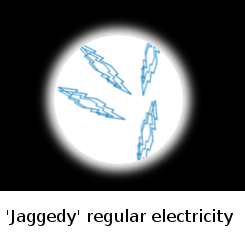 Well now Professor Moonbeam believes that this sort of thing will soon be a thing of the past, following the development of 'ovoid electricity'. 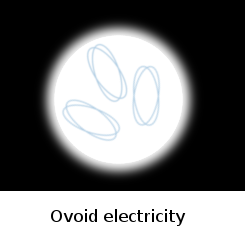 "Ovoid electricity," says the Professor, "is characterised by its smooth, oval shape, meaning that you are far less likely to get impaled on its horrid spikes and become the victim of nasty, buzzy electro-death. "It also," he adds, "flows much more easily through wires and cables, meaning that it's actually ten times faster than normal electricity, which is handy for things like toasters because it means your breakfast can be ready much sooner." In fact, Professor Moonbeam claims that ovoid electricity is so safe that it's perfectly okay for small children to handle it without the precaution of thick gloves and insulated trousers. To prove his point, Moonbeam took twenty children donated to him from a local primary school and wired them up to his ovoid electricity generator. He is delighted to report that more than two thirds of them survived which, in scientific terms, he classes as an unqualified success. However, independent testing has revealed that ovoid electricity is not entirely problem free, particularly as its almost total lack of friction means that it is difficult to contain. In one experiment it was observed to drop straight out of the cable that was conducting it, rolled across the floor and disappeared into a drain. This has sparked fears of ovoid electricity entering the water table and contaminating wildlife. Professor Moonbeam has continued to hotly contest this assertion and firmly believes that such a situation is impossible. However, multiple reports of electric frogs spotted in the vicinity of his laboratory would seem to suggest otherwise.